226 Seaward Street formerly 226 St James Street, Kinning Park, Glasgow. The Auld Hoose on the left hand side, 226 Seaward Street, Kinning Park. 1960s. In 1877 William Smith acquire a public house licence to sell wines and spirits and a licensed grocer’s. William lived with his family at 222 St James Street. In 1879 the licence was transferred to James Simpson. Mr Simpson was very successful here. When he started out he lived at 89 West Scotland Street not far from his pub. In 1880 he moved to 98 Pollok Street then to 12 Percy Street in the 1895. James continued as licensee until 1899. The licence was the taken over by James Reid who continued through the First World War. During the 1920s Well-Known and respected wine & spirit merchant Kenneth McLean was running a successful business here. 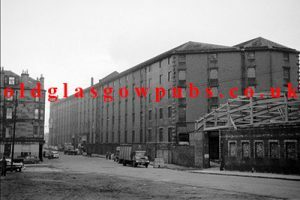 Kenneth also ran McLean’s Bar at 446-48 Rutherglen Road at the corner of Pine Street, Gorbals. Kenneth continued as licensee until after the Second World Ward. 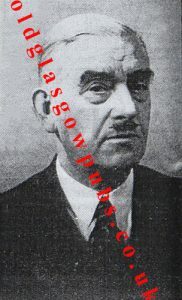 Mr Kenneth McLean was a native of Mull and was born in the year 1878. After leaving school he was employed in the grocery trade and came to Glasgow and to the licensed trade in 1899. At the age of twenty-one he joined the staff at Mr Hamilton’s pub in 466 Rutherglen Road, starting at the bottom of the ladder. He was always a very hard working young man and after his long apprenticeship had the best training working under Mr Hamilton. His early experience included ten years as manager of the Rutherglen Road establishment. He built up a good relationship with his employer and was a sad day when Mr Hamilton died in 1915. Things didn’t look good for Mr McLean as the depression of the First World War was taking it’s toll, he must have thought during this period, that he might be out of a job after the death of his employer and friend. However Mrs Hamilton took over the licence and ensured the staff that their jobs were still safe. The running of the pub, and surely all businesses during the war was very hard times. The business of running a public house in the Gorbals was too much for Mrs Hamilton, she decided at it would be better for all if she sold the business. Mr McLean jumped at the chance to become his own boss and took over the pub as sole proprietor. The trade picked up after the war resulting in Mr McLean acquiring another pub, the Auld Hoose at 266 Seaward Street on the south side of the city. Seaward Street was formerly St. James’ Street. Mr McLean disposed of this pub in 1946 but carried on at 466 Rutherglen Road. For many years Mr McLean took an active interest in the affairs of the Glasgow and District Licensed Trade Defence Association and had served it for several years as a Director. He also identified himself clearly with Veto Defence aspects of the trade. He was an honorary president of the Royalty Burns Club with which he had been associated for 45 years, he was also President of the club from 1948-50 after giving it splendid service on the committee. Kenneth was an ardent supporter of the Mull and Iona Association. Another of his interests was Free-Masonry and had a long connection with Lodge The Gael, No609, at which he was a past R.W.M. Bowling also attracted his attention and he was a past President of Hutchesontown Bowling Club. Sadly Mr McLean died at the age of 88, in 1966, he was pre-deceased by his wife and lost his eldest son in the war, he left four sons and a daughter. His second son was in the Forces for four and a half years, the third was associated with his father in the business and was in the Navy for some time and the fourth was in the Far East, his fifth son was still at school at the time of his death. Mr McLean’s sons, William and Lachlan managed the Rutherglen Road premises, the funeral to Craigton Cemetery was largely attended, those including contingent of Licensed Trade personalities among them being representatives of the brewers and distillers and the Royalty Burns Club. The Rutherglen Road premises stayed in the family until it was finally demolished in the City Councils Redevelopment Scheme which saw not only pubs being demolished but whole communities. 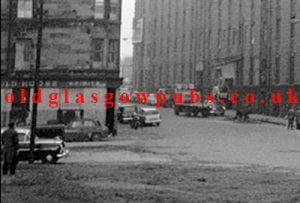 During the 50s Donald Stewart ran this old pub and afterwards Campbell M Lechie took over until the pub was demolished in the early part of the 1960s. Do you remember this old pub? If so please get in touch.